The colour for this soap is obtained from the azulene content of the Blue German Camomile in this delicate, gentle soap. We have also included pure lavender essential oil to make this a really mild and kind to the skin soap. Authentic Chamomile aroma, with anti-inflammatory, healing and soothing properties. It is also very effective for insect bites, sore skin, cuts and grazes [also a safe and gentle cleanser for baby skin]**. Suitable for all skin types, even fragile, delicate and sensitive types. ** Use this soap as a gentle cleanser for your baby, as with all soaps never get the lather in your eyes. 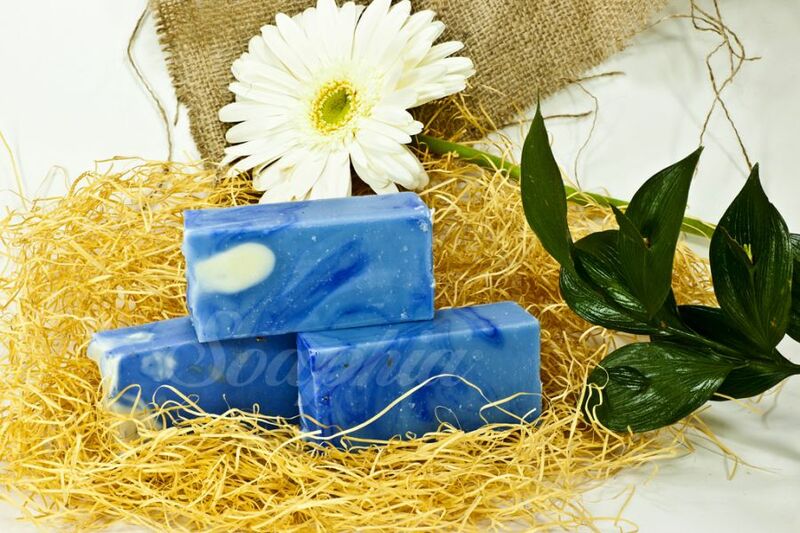 You can wash baby’s skin and hair with this lovely, mild soap and we recommend that afterwards you use our natural, unrefined, fair-traded 100% pure Shea Butter on baby’s body. It makes a very good balm for nappy rash and also is kind enough to use on any scalp irritations.